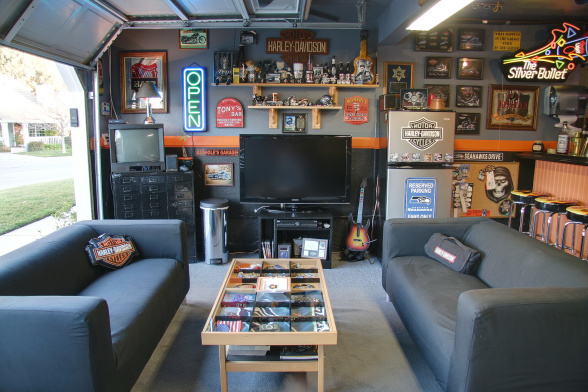 Did you know that man caves have been exploding in popularity in recent years? It’s true. And it’s really no surprise. After all, what guy doesn’t dream of having a snug and cozy place all his own? A place intended exclusively for fun, relaxation, and recreation – for guys? A common location for a man cave is the basement. And indeed, a basement can make a wonderful home for a man cave. But not every home has a basement. And not every basement is suitable for that purpose. But most homes have garages. And most garages are perfectly suitable – or can be made suitable – for a man cave. 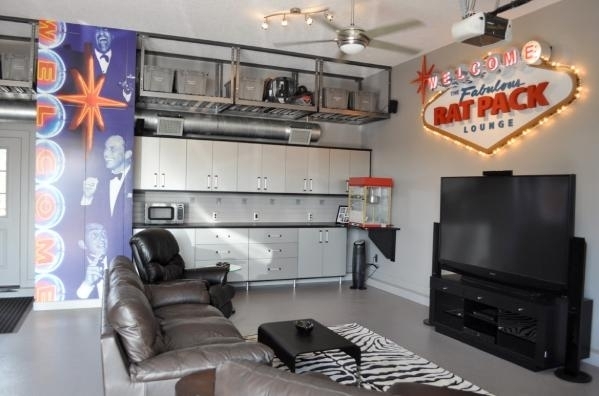 Yes, it’s true: the first step to creating a great man cave is anything but fun. But if your garage is like the average garage, it’s a cluttered mess. That’s because most of us use our garage as a catchall storage area. You’ll have to get that mess under control before you can proceed with your man cave. For many, though, completing this first step is such a turn-off that they never make it to step #2 – and so ends the dream of a garage man cave. Fortunately, though, professional help is available for quickly and easily having your garage cleaned, organized, and ready to proceed. Most garages are not well insulated – or insulated at all. That won’t do for a man cave. After all, your man cave should be a place of retreat at any time of the year, not just during times of temperate weather. Insulating a garage can be a big job. But it’s not an overly complicated task, and can be a great DIY project. Here’s a source you can use to learn more about the process and costs of an insulating project. The typical garage floor is a cracked, cold, dusty, bare slab of concrete. That doesn’t make for a great man cave floor. The solution is to finish the garage floor with a custom-installed floor finish. Polyaspartic Polyurea is the best. A side benefit of having a floor finish installed is that you can turn your floor into a component of your man cave décor. You can do that by having a custom design installed with your flooring system: A sports team logo, uniquely artistic coloring, an homage to your favorite hobby – anything you want. After all, it’s your man cave! Most garages are rather lean on lighting. There’s enough light to navigate your way through the garage, but not really enough for man cave activities. And quite frequently, garage lighting consists of just some bare bulbs that cast a harsh and glaring light. You’ll want to upgrade the lighting in your garage so that it’s better lit, and with lights that are pleasant and attractive. Pendent lights and recessed lights are popular options that might be worth considering for your man cave. Complete the four steps above, and you’ll have the makings of a great man cave in place. You won’t be quite finished yet; you’ll want to install all the special touches of décor and ‘fun stuff’ that transforms a room into a man cave. But the best part is that you’ll be converting your garage into your man cave – and right now it’s probably nothing more than a storage place for junk and clutter. So who can protest if you lay claim to that messy, junky place for your new man cave? This entry was posted on Sunday, March 13th, 2016	at 8:33 pm	. You can follow any responses to this entry through the RSS 2.0 feed. Both comments and pings are currently closed.